1009 WOOD SHELL 'Retentor' processed - available in China White or Jet Black finishes. 8 modern design separate tension aligning fittings and floating head type counter hoops, chromium plated. 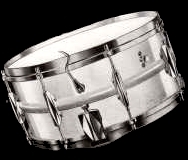 1010 METAL SHELL, with in-curved edges and centre swage for strength and rigidity. All chromium plated. With 8 streamlined separate tension fittings. Internal tone control. Metal work crystal chromium plated. Retentor-processed Wood Shell. Die-cast streamlined self-aligning, modern type single tension fittings. Dust-proof threads, single angle type counter-hoop. Bottom head studded on to the shell. Internal tone control.